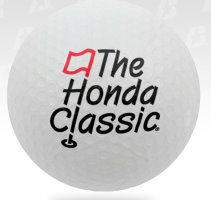 The 7" diameter dimpled rubber golf ball is a great product for golf tournaments of all types. They are less than $ 10 each in the minimum imprintable quantity of 144. 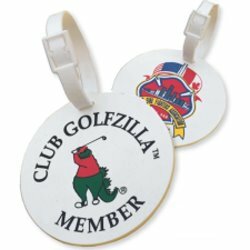 The Golf/Ball Tee Magnet on the left measures 1 3/4" X 3" and in the minimum of 250 is less than $ 1.25 each. 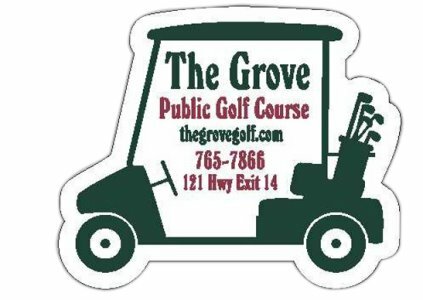 The Golf Cart Magnet is 2 1/2" X 3" and in the 250 minimum is less than $ 1.50 each. 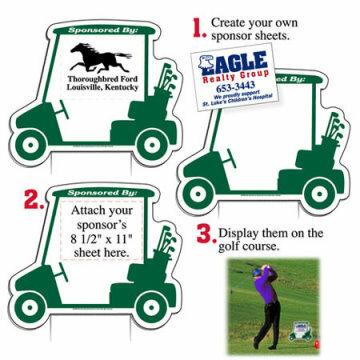 This 5" X 4" Golf Kit is a great give-away for golf tournaments, trade shows, golf related businesses, golf associations and golf organizations. It is available in Black, Royal Blue, Pink or Red. Each kit consists of 3 golf tees, 1 divot tool, 1 golf pencil, 2 antibacterial wipes, 2 antiseptic swabs, 3 afterbite sting swabs and 4 bandage strips. Your custom imprint goes in the imprintable area of 3" X 1 1/2". Less than $ 5.25 each in the minimum of 100. 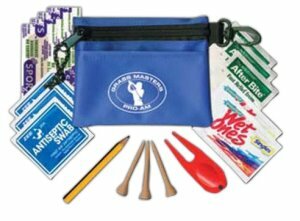 We have a total of 10 different types of golf kits that are currently available. SPECIAL OFFER - Send us your artwork text for your golf club, golf business, golf organization or golf association and we will do a Golf Kit sample with your text/logo at no charge. Please note this offer is not good for individusl golfers. 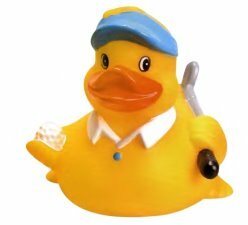 The golfing duck on the left measures 3" long X 3" high X 2 5/8" wide and provides an imprint area of 7/8" wide X 1/2" high. It is also available as a keychain. Middle picture is the Birdie Golf Ball Duck that is 3" long X 3" wide X 3 1/2" high with an imprint area of 1' wide X 3/8" high. It is also available as a keychain. 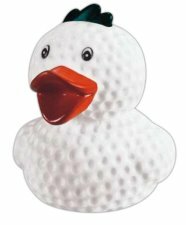 The far right picture of the Golfer duck is 3 1/2" long X 3 7/16" wide X 3 3/16" high with an imprintable area of 1 1/8" wide X 1/2" high. 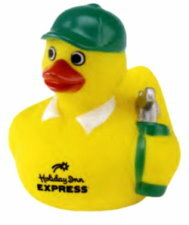 Minimum order on the Golf rubber ducks is 50. 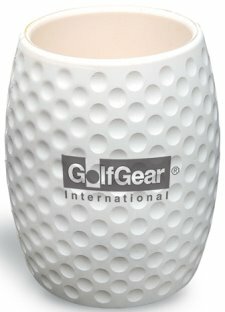 This handy golf ball cleaner fits in your pocket, stays wet to clean your golf ball while keeping your pocket dry. It provides an imprint area of 2 1/4" in diameter and in the minimum of 50 is less than $ 4.50 each. 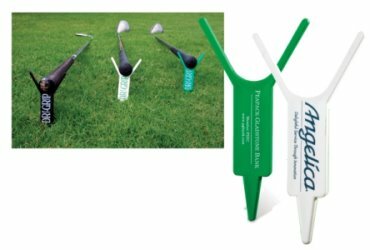 The Golf Club holder keeps your clubs off of the wet grass and dirty areas. Can also be used as a divot tool. Available in green or white. Less than $ 1.35 each in the minimum imprintable quantity of 100. Chip Shotz Golfer. Shoot a round on your desktop! Magnetic balls stick to the green and moveable hole. You control the swing! Individual or group play. Color as shown.Measures 4 1/2" X 2" X 3 3/4" and the custom imprint area is 2 1/8". Less than $ 3.00 each in the minimum of 250. Made from white, all-weather, corrugated plastic that measures 23" X 19 1/2" and is 3/16" thick and printed on one side in Dark Green. The Golf Hole Sponsor signs come with 1 sign and 2 rods. The rods are 24" heavy-duty, spring steel wire. In the minimum of 20 they are less than $ 10 each. 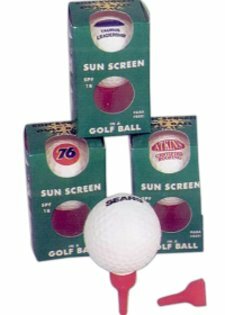 Sunscreen lotion in golf ball with tee shape cap. A necessary health protection product most golfers forget to bring. 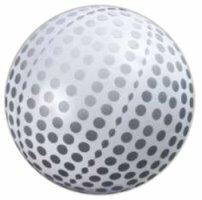 Simulated golf ball contains 1.1 oz. of SPF 18 lotion with a coconut scent. Remove tee cap and squeeze ball to release concentrated, non-greasy protection. Suitable for outdoor use by all man, women or child age group. 1 - 2 logo or typeset message imprinted on top area of 7/8". Less than $ 4.60 each in minimum of 50. The inflatable golf balls are available in both a 6" and 14" size. The 6" size provides an imprint area of 3 1/4" wide X 1 1/4" high and in the minimum of 50 is less than $ 2.50 each. The larger 14" size provides an imprint area of 6 1/4" wide X 3" high and is less than $ 3.00 each in the minimum imprintable quantity of 50. 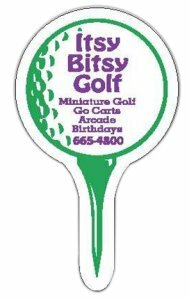 The inflatable golf club is 49" in length and provides an imprint area on the club of 11 1/8" X 3" and it also can be imprinted on the head in an area of 6 1/8" X 8". In the minimum imprintable order of 50 they are less than $ 3.70 each. 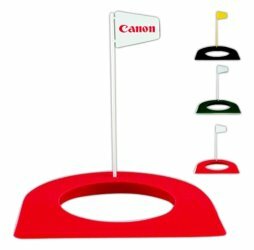 This aluminium alloy desktop golf game measures 3 1/2" X 9" X 1/4" and provides an imprintable area of 1/2" X 1" on the flag. 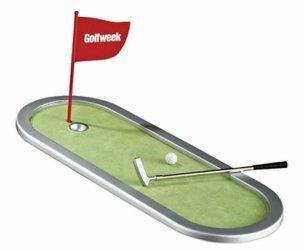 Each game includes a miniature putter, golf ball, and felt putting green with a flag stick. Less than $ 13.00 each in the minimum quantity of 48. The golf umbrella hat is a big hit at junior toutrnaments as well as adult golf outings. It keeps both the sun and rain off! It measures 24" arc and provides an imprint area of 3 1/2" X 3 1/2". Available only in the alternating pattern of blue, white, red and green. Less than $ 4.70 each in the minimum imprintable quantity of 75. 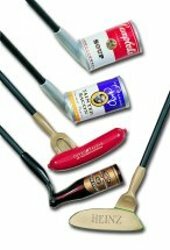 Golf - Strong flexible polyurethane can holder with textured grip, holds a 12 oz. can, 4 1/2" tall, 3" bottom diameter. Keeps your drink from warming in the sun. Great for parties, back yard bbq and watching the game on TV. 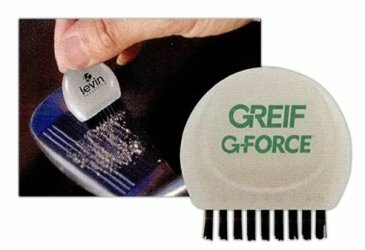 Provides a custom imprint area of 1 3/4" diameter. Less than $ 5.00 each in the minimum of 75. Tag your next marketing campaign to every bag with this customized bag tag! It is circular and features a personalization label on the back. Great for backpacks, workout bags, golf, or travel. 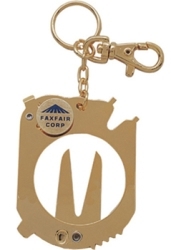 The bag tag on the leftmeasures 3 1/2" in diameter with an imprint area of 2 7/8" and is only available in white. It is less than a dollar each in the minimum of 250. On the right is a full color 3 1/2" X 4 7/16" bag tag that provides a custom imprint area of 3" X 3 3/4. It is less than $ 2.00 ech in the minimum of 250. Golf cooler kit without golf balls. 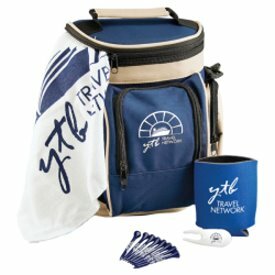 Includes golf cooler bag, 15" x 18" golf towel with grommet and hook, eight 2 3/4" tees, divot repair tool and collapsible can holder. Price per pack is less than $ 23.50 in the minimum of 36. 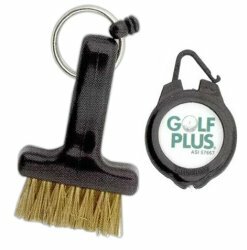 The EZ Brush is an innovative new golf brush that features a compact, ergonomically designed brush with brass bristles & retractable nylon cord that extends up to 30 inches. Imprintable area is 1" in diameter and in the minimum quantity of 100 they are less than $ 9 each. 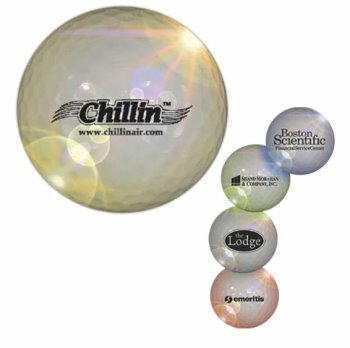 Available in Red, Yellow, Blue, Jade or White these light up golf balls are great for nightime golf play and as tournament awards. The Light Up Golf Balls flash a pulsating light on and off so that you you can find your balls in the woods or fairway. The imprintable area is 1" in diameter and in the minimum imprintable quantity of 72 the price is less than $ 6 each. This Golf book contains over 60 full-sized original page reproductions. 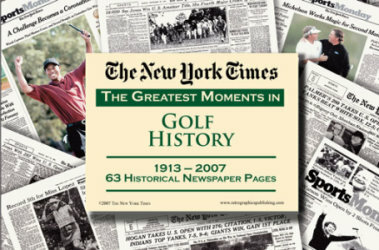 Opening each page is like opening a window into Golf history as you view the actual articles, golf advertisements and photographs of days gone by. You may customize the front page with your full-color logo and personal message and create a lasting gift that is sure to be treasured and shared for years to come. Less than $ 10.00 each in the minimum imprintable order of 50. 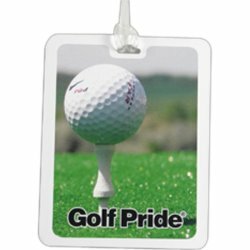 Great item for golf tournaments this 6 1/4" X 8 1/4" Golf Picture Frame holds a 4" X 6". Minimum imprint is 150. Here is the first umbrella designed specifically with your golf clubs in mind. The Drizzlestik (R) golf club umbrella. Don't let rain ruin your game! The ultimate wet weather golf club protection! Patented inner liner- provides protection between valuable golf clubs and umbrella frame. Opens in seconds allowing quick and easy access to all golf clubs. The telescopic shaft is now available with spring feature. Extra deep canopy offers exceptional protection even in driving rain! Lightweight - 11.9 oz. Less than $ 12 each in the minimum custom imprintable order of 50. Polyester blend 15" X 18" white towel, with brass grommet and hook. 85% polyester / 15% polyamide. Provides a custom imprint area of 11" X 15". Less than $ 2.00 each in the minimum of 250. Golf - Playing cards with 52 tips on popular topics. We've done the research, you get the rewards. 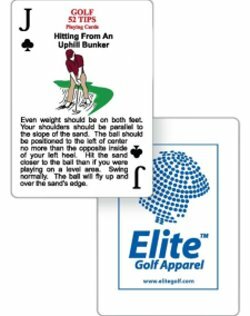 A resource for information, helpful hints and tricks of the trade for your golf game all collected in a deck of authentic playing cards. Each topic-specific tip appears on the card face and your logo appears on the white card back. Less than $ 5.75 in the minimum order of 50 decks. 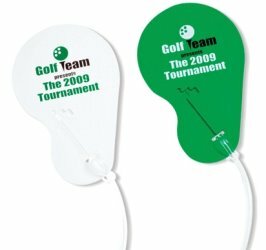 The Golf Luggage tag is available in green or white and is in the shape of a putting green. Less than $ 1.30 each in the minimum imprintable quantity of 100. 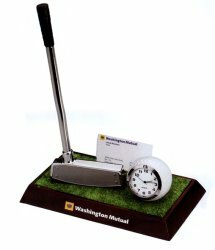 This unique Golf clock has an attached golf club pen holder (pen included), a business card holder and wooden base. It measures 5" X 2 1/2" X 3 1/4". It provides a custom imprint area of 4" X 2". Great product for tournament volunteers and sponsors! Less than $ 30.00 each in the minimum of 50. 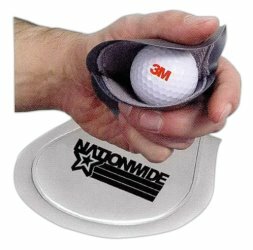 This mini putting cup measures 6 7/8" X 6 7/8" and provides an imprint area of 1 1/2" X 3/4". 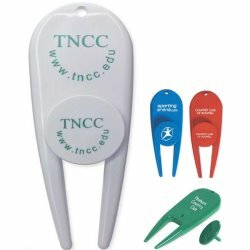 It is available in your choice of black, green and red and the flag colors can be either white or yellow, In the minimum imprintable quantity of 100 they are less than $ 2.50 each. The club groove brush for pure contact & better performance. It has stiff non-wire bristles that clean grooves and its small size fits in your pocket. Imprint area is 3/4" X 3/4" and in the imprintable minimum of 100 they are less than $ 1.75 each. 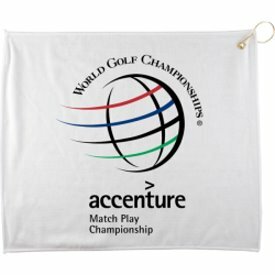 Here is a great award or incentive item that any golfer will be excited to display on their desk. The 1 3/4" X 5" golf ball memo holder has a metal cable and alligator clip to hold documents and notes. It provides an imprint area on the ball of 3/4" X 5/8" and in the minimum imprintable quantity of 150 is less than $ 1.95 each. We can provide you with either plastic or wood tees and our minimum amount of imprintable tees is 1000. Tees pictured below are made of lacquered hardwood and are available in many colors as illustrated in the picture. The tees can be printed in black, red, blue, green (both light & dark), orange, brown or white. The tee sizes below are either 2 1/8" which are imprinted using the hot stamping method or the slightly larger 2 3/4" tees which are ink imprinted. The Novel-tee 4 1/2" long tee minimum order is a quantity of 250 and will be the hit at any course when you give them out as a tee prize. Need to really make an impression with a client ? You may wish to consider our line of stock product putters that we can put your custom logo and imprint on. These are an outstanding golf item and the minimum is only twelve. These distinctive and uniquely shaped models instantly draw attention to your company's product or service. Successful on-going programs have been in dealer promotions, self liquidating retail promotions, customer new and continuing order incentives, or just for fun gifts at special events. All putters pictured below are standard shapes either available with or without an imprint. All putters can be used in tournament play and have been regulation weighted by precisely selecting either solid brass, stainless steel or aluminum metal in each of the various shaped designs. 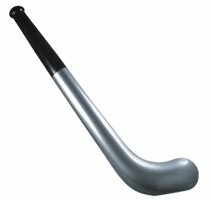 Shafts are New Dobi Lite Titanium magnesium composite alloy in a matte black finish. Chrome steel optional.Call us 800 960-9080 for current pricing. Shown below are some of the custom colors and imprint methods available. For a nominal tooling fee and a minimum of 250 a special design for your product or service can be developed. Pictured below is a clipboard that shows the layout of the course along with the yardage for each hole. This is a great tournament award or for new members of a golf club. Call 800 960-9080 for current pricing. The golf ball balancer automatically realigns your balls in the heaviest areas around the equator. After using this machine your balls will not wobble and will line up on the green more accurately and drive further from the tee with fewer hooks and slices. The product is 4 1/2": X 3 3/4" and provides an imprint area of 1 1/2" X 3/4".Less than $ 45 each in the minimum imprintable quantity of only 25. Here is a really unique item ! 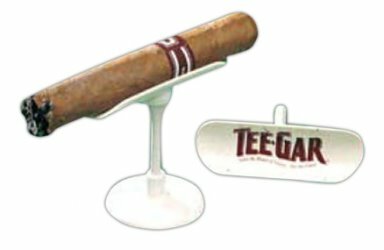 Our cigar holder holds your cigar as you prepare to tee off ! It's on a 2 1/8" tee and provides an imprint area 1 1/2" X 5/8". In the minimum of 50 they are less than $ 4.75 each with your custom imprint. 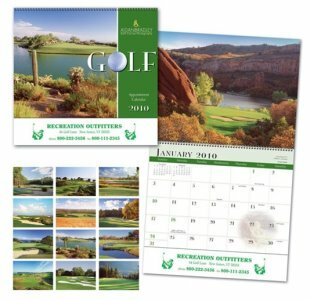 How about a golf calendar with your custom imprint ? Illlustrated below is just one of the many golf related calendars that we have available. The golf calendar that appears below is a 10 1/2" X 18 1/4" Golfing calendar. Golf is one of the fastest growing sports among businesspeople.. Reach the golfing executive right in his office with your advertisement. These golf calendars are certain to be noticed by all. Minimum quantity on the calendar pictured below is 300 and they are less than $ 1.25 each with your custom imprint. 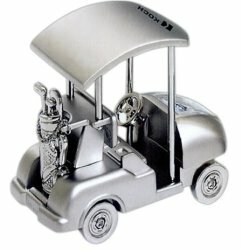 The miniature Silver golf cart is 1 1/2" X 2 1/4" and provides an imprint area of 1" X 3/4". It has mini golf bag and clubs in the back of the cart. Less than $ 22.50 in the minimum imprintable quantity of 50. Need a good quality golf umbrella ? We have a large collection of umbrellas to chose from. Illustrated below are several samples of 37" and 40" which are our two most popular sizes. Our 37" model gives you an imprint area of 8"X 8" while the 40" model has a 10" X 10" area for your imprint. There are many color combinations available both in an alternating color combination and also in solid colors. Our 37" model has a rib of 27.5", an arc of 55" with a diameter of 44.5". The 40" golf umbrella provides you with a 32" rib, a 64" arc and a diameter of 54". These great umbrellas are safe on the course with a tough fiberglass and genuine wood handle and a double rib construction.Need a free umbrella catalog? Give ius a call at 800 960-9080. Pictured below is the ten in one golf tool. It is a combination divot repair tool, scraper, spike wrench, groove cleaner, ball marker, face line cleaner, ball checker, screw driver, knife blade and keychain. It measures 2 1/4" X 2 3/4" and provides an imprint area of 1/2" X 1/2". Less than $ 3.85 each in the minimum imprintable quantity of 50. 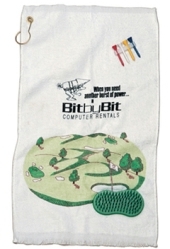 Here is a golf towel that measures 25" X 13" and it comes with a tee holder on the towel and a scrub brush. The imprintable area on the towel is 9" X 4 1/4". Minimim imprintable quantity is 50 and they are less than $ 7 each in that quantity. Here is a wondeful idea for golf club members or to be used as tournament awards for both golfers and volunteers. You can put the course design on a plate complete with any information that you wish about the course. On the back side of the plate you can put information on the history of the club. Every member will want what to remember that "special shot" on a particular hole. 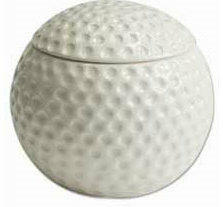 This golf ball clock measures 1 3/4" X 2 1/2" and provides an imprint area of 1" X 1". In the minimum imprintable quantity of 75 they are less than $ 16.00 each. 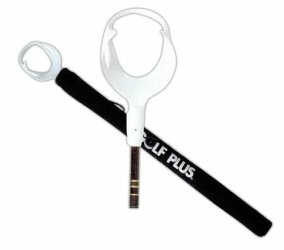 Weighing only 7 ounces this retractable golf ball retreiver is 18" long when retracted. It telescopes up to 10 feet and has a fiberglass shaft that locks into 9 different positions. Comes with a black zippered cover that provides an imprint area of 7" X 1". In the minimum quantity of 24 it is less than $ 20 each. 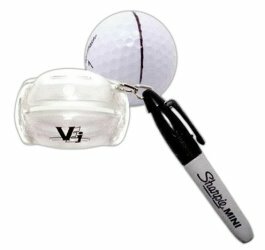 The mini golf bag holds up to 3 golf balls, cell phones or sunglasses and has a zippered closure. You can clip it to your golf bag or your waist. It measures 2" X 6 1/2" and is available in blue, red, white or black. It provides an imprint area of 2 3/4" X 7/8". In he minimum imprintable quantity of 150 it is less than $ 3.75 each. For either a great corporate or tournament golf award, how about golf balls with a persons picture on them along with your message ? Your balls will be the talk of the tournament ! 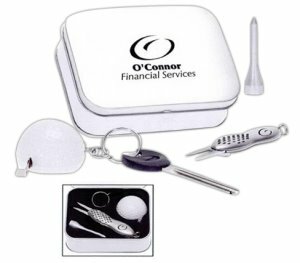 The kit measures 4 1/2" X 3 1/4" X 1 14" and the kit includes a golf ball keychain with a 30" tape measure, a divot replacer and tee. The imprint area on the silver tin is 2 1/4" X 2 1/4" and in the minimum of 100 is less than $ 6.25 each. 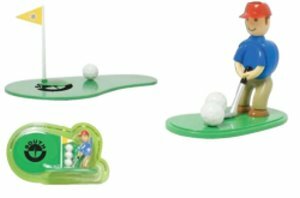 Measuring 2" X 1 3/4" X 2" the rubber frog golfer provides an imprint area of 5/8" X 3/16" and a minimum imprintable quantity of only 50. 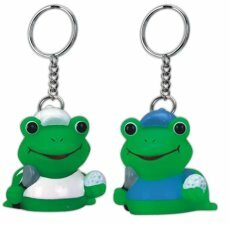 Also available as a standard size golf rubber frog. The Groove Tube is a portable club head cleaner that cures the continual problem of keeping the grooves and faces of your clubs clean throughout a round of golf. It is a great advertising medium because of its repeated use. Fresh water is stored in the bottle and released thru a pressure sensitive washer in the bottle cap. Just squeeze the bottle and send a stream through the brush. Dirt and grass will quickly be brushed away. 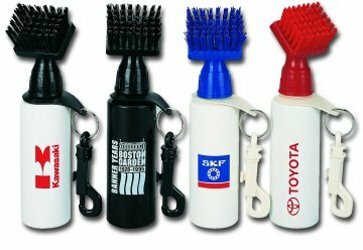 Available in black and white bottles with blue, red or black bristles. Imprintable area is 1 1/4" X 2 1/4". Less than $ 7.25 each in the minimum imprintable quantity of only 50. 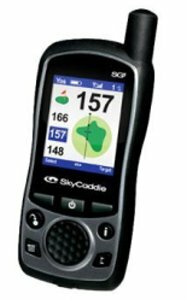 The Skycaddie GPS system has a large color display & a long lasting rechargablebattery.It includes SkyGolf's patentted IntelliGreen technology that enables golfers to measure the full depth & shape of the green from any angle of approach & shows distances for all taegets & hazards. Come in a zippered case with a one color imprint on the case i the imprintable area of 3" X 2". In the minimum of 1 it is less than $ 400 each.